The Toronto Star has long been a global media innovator when it comes to using the Google Maps API. Web editor Patrick Cain writes a weekly column called Map of the Week, which invariably includes a useful Google Map mashup illustrating one aspect of Toronto life or local news. A map showing applications to evict in Toronto using shaded polygons. 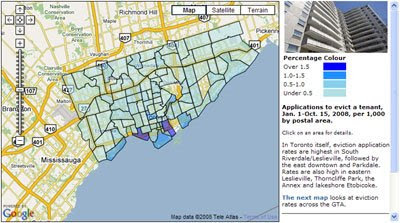 A map showing applications to evict in the GTA showing shaded polygons. This map looks at the top individual addresses for eviction applications in Toronto. This only scratches the surface of the large number of amazing maps created by The Toronto Star. To view more just check out the archive section of The Map of the Week column.